In Dublin on October 31, 1867, two constables of the Dublin Metropolitan Police were patrolling the foggy, unlit streets around Temple Bar. It was some seven months after the attempted Fenian Rising in the city and the Irish Republican Brotherhood, with over 4,000 members in Dublin, were still plotting insurrection. The first constable, John Keena tried to arrest a suspicious looking man on Wellington Quay, but the man pulled a revolver and shot him, wounding him fatally. Another policeman, Sergeant Stephen Kelly tried to intercept the gunman but was also shot and badly injured. About a month later, Patrick Lennon, a Fenian ‘captain’ in the rising of March 1867, was arrested and charged with the shootings. He was convicted of belonging to an illegal organisation but acquitted for want of evidence of the Temple Bar shootings. In the Shadow of the Brotherhood, a meticulously researched book, Barry Kennerk brings the reader through this story, along the way encountering drunken prostitutes, burnt-out gun-toting American Civil War veterans, G Division DMP detectives and Fenian assassins. The story contains many fascinating anecdotes – especially vivid are those of the police arrests in the streets of armed Fenian suspects. The Shadow of the Brotherhood, is a meticulously researched book and an interesting window into the aftermath of the Fenian Rising, but the detail can be overpowering at times. The structure of the book is a little like a detective novel, with the reader slowly being presented, in painstaking detail, with each new piece of evidence in the police hunt for the killer. This approach, unfortunately, does not really work. The piling up of detail in sequential order gets a little tedious and after a while, the reader longs for Kennerk to step back from his research a little and either find a narrative flow or else explain in greater depth the context and significance of the events described. Having said that, this book is a very interesting window into the aftermath of the Fenian Rising in Dublin. The Brotherhood was in disarray after the abortive insurrection at Tallaght in March. In Dublin it was riven with informers and harassed by police and military raids. To guard against informers and over-zealous policemen, the Fenians formed a ‘shooting circle’ –armed with revolvers and dedicated to eliminating those harmful to the Brotherhood. It is Kennerk’s thesis that constable Keena came upon one such gunmen on his way to assassinate an informer. Some chapters rove further afield from Dublin, to Britain and America, where different and sometimes rival IRB factions carried out somewhat off-the-cuff attacks. In September, there was the famous raid on a prison van in Manchester, which freed two Fenian leaders but accidentally killed prison guard. Three Fenians were later convicted and hanged for the attack –entering the nationalist pantheon as the ‘Manchester Martyrs’. In November came the Clerkenwell explosion, where a renegade Fenian group blew down the wall of a London prison in order to extricate their prisoners, only to kill twelve people in the neighbouring houses and, Kennerk’s book rather poignantly informs us, causing the miscarriage of dozens of unborn babies in the area. Kennerk’s sympathies clearly lie with the unarmed DMP constables shot down in October 1867 on the streets of Dublin. He writes that, “the story of Irish nationalism is not simply some Boys Own Adventure…Every armed struggle incurs a cost in innocent lives”. He describes his book as, “an investigation into the murky world of the IRB radical [and] a portrayal of the suffering endured by the victims of nationalist violence”. So deep does his sympathy for the policemen go that he has had erected in Temple Bar a memorial to the pair shot there in 1867. As a result, one weakness of the book is a lack of empathy for where the Fenians were coming from. Most of Kennerk’s sources are either those of the police, the British authorities or the unionist press – who tended to depict the IRB’s activities as motivated by sheer blind malice. But the insurgents clearly had substantial support in Dublin and elsewhere – one chapter of the book describes a march, thousands strong through the city centre to Glasnevin cemetery, in honour of the three Fenians hanged in Manchester. More might have been done to show how the Fenians themselves saw the situation at the time. Ireland was not a democracy, the franchise was severely restricted by property and even Conservatives admitted that there existed grave social injustices in the country. And real power in Ireland lay with unelected officials appointed in London. On top of that Habeus Corpus, or normal peacetime law had been suspended since 1865 in order to put down the Fenians. Glorifying the use of political violence is indeed something historians should try to avoid but all conflicts have two (or more) sides. The DMP constables were clearly not neutral in this confrontation and although usually unarmed, were able to call on armed support from the RIC and the British Army. Moreover, it seems from the description of the shooting that it was not an assassination but a panicked action of a gunman trying to escape arrest. The Fenians’ enemies accused them of lacking the bravery to mount a stand-up fight against regular troops or police and resorting to cowardly terrorism and assassination. The script here is familiar to all modern readers. The interesting thing that comes across in The Shadow of the Brotherhood, is that the Fenians themselves agreed. Patrick Lennon, charged with the Temple Bar shootings, openly admitted to leading attacks on Royal Irish Constabulary barracks in south Dublin in the March 1867 rising, “and if another insurrection broke out, I would lead another party”, but condemned both the shootings of Keena and Kelly and the Clerkenwell explosion – neither of which, he maintained, had anything to do with the IRB. The “shooting circle”, is strikingly reminiscent of Michael Collins’ (another IRB man) IRA Squad of the 1920s, but they were far less ruthless. In contrast to dozens of killings of policemen, detectives and informers in Dublin in 1919-21, the Fenian shooting circle killed no more than four. Rather than the use of terror, what the Fenians envisaged was open battle, or least well- organised guerrilla warfare, with the British and their allies – a hopelessly unrealistic, but apparently genuinely held position. This despite the fact that the Temple Bar shootings alone showed the potential of small group assassinations as a revolutionary weapon. In response, the police had to be armed, informers called in, the Special Criminal Court (then as now) in Green Street fortified and guarded by cavalry and armed police. Delivered with enough ruthlessness some fifty years later, a concerted strategy of assassination at once paralysed the workings of the police and provoked the state into a counter-productive repressive reaction. It is perhaps to the Fenians’ credit that they did not contemplate this. There is nothing particularly uplifting about gunning down unarmed and defenceless people – be they police, revolutionaries or their informers. And, as Kennerk points out, such actions have a human cost, both in lives and in the pain of those close to the victims. The description of constable Keena’s slow and agonising death due to internal bleeding is genuinely affecting, as is the reaction of his father, “Oh that I should rear my fine boy to such an age to be assassinated!”. Barry Kennerk some time ago contributed this very evocative piece to The Irish Story on the life of Dublin policeman in the 1860s. Another review of Shadow of the Brotherhood is here at Pue’s Occurences. Written by: John_Dorney on 5 April, 2011.on 29 July, 2011. 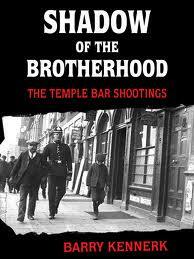 2 Responses to "Book Review: Shadow of the Brotherhood, The Temple Bar Shootings"